It’s easy to get used to wearing the same thing to work over and over again. This approach to workwear is cheap and requires little effort. But at some point, it really is time to cast a critical eye on your scrubs wardrobe and clear out the pieces that just aren’t cutting it anymore. Here are seven items you might find in your closet that mean you’ve put off this task for too long. Do you own scrubs tops in bright sherbet colors covered with geometric designs? Do they date back to the Reagan era? With so many trendy, modern prints to choose from today, there’s no excuse for wearing outdated designs. By the way, if you sewed shoulder pads into your scrubs tops back in the day, we can’t be friends anymore. To stain is human; to bleach, divine. But even a heavy-duty dose of Clorox won’t get out some spots. Everyone expects nurses to get nasty stuff on their scrubs at work. What they don’t appreciate is recognizing the same stuff that spilled on your scrubs two weeks ago showing up again. Wave the not-so-white flag of surrender and let permanently stained scrubs retire with dignity. Yes, “sagging” is a style. It’s just not one you want to follow at work. If you have scrubs with a missing drawstring or weakened elastic, you might find yourself accidentally falling into this bottomless pit of fashion hell. Stop hitching up or safety-pinning your pants and spring for new ones with real staying power. The amount of stuff we tote around at work takes a real toll on our pockets. If the pocket itself starts coming off, that’s a quick fix. But eventually the fabric on your scrubs at the corner of the pocket gives way—leaving a little square tear. Even if you patch it, this damaged area won’t look the same again. You don’t want to be known as the Raggedy Ann nurse. You bought these scrubs when chartreuse green or mustard yellow was all the rage. But the truth is that these colors look absolutely hideous on you. If these scrubs have been sitting in the back of your closet, barely worn, you can donate them. That way, you can still feel good about a purchase that went horribly wrong. These are the magical scrubs pants that will fit again one day—after you lose that last five pounds. It doesn’t hurt to dream (or exercise more faithfully). But there’s a very good reason not to keep them in your closet: You might be tempted to wear them to work when your other scrubs are in the wash. That’s a fashion mistake you really don’t want to make. Embrace the present and the body you have now by treating yourself to scrubs that fit well. 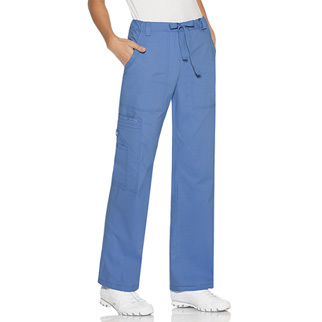 Can you even remember where you got those scrubs from or have you “lost your power of recall”? We all have some favorite scrubs that can be difficult to leave behind. But if you can’t even remember where you bought them, it’s probably time to cut them up for rags. Finding a new favorite style can be fun if you’ve got the right attitude. 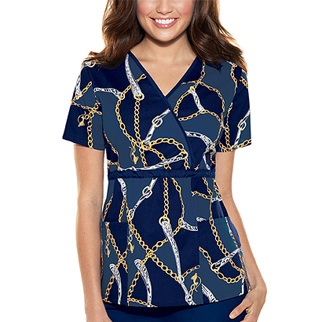 The Chain Link scrubs top from BabyPhat’s “Gilded Age” collection is based on nice neutral blues with a print that brings to mind a Coach bag or an HermÃ¨s scarf. You can’t go wrong with that! The Skechers unisex drawstring pant is an item you’ll find yourself pairing with many different tops. It’s got the right fabric (poly/cotton/spandex poplin) and there are plenty of pockets. With sizes up to 5XL, you’re sure to find one that’s a good fit. 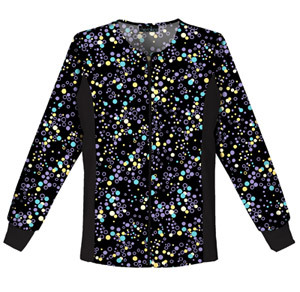 This Zoom into Bloom top from Dickies’ new line of fashion prints is subtle but engaging. Turquoise accents are in style right now. Fortunately, this color looks good on a very broad range of skin tones. Ditch the old Members Only jacket in favor of a warm-up that’s perfect for the coming winter. Cherokee’s new additions to the Flexibles line include this dotted black jacket that’s eye-catching and figure-flattering.